Marking and feedback is a hot topic at the moment following further guidance from Ofsted that they don’t expect to see a particular type or frequency of marking/feedback on student work – it’s for schools to decide what is the best method to help students improve. Should the frequency of feedback be dictated by a central policy? A quick poll on Twitter suggests this approach is common practice. But are we wrong to adopt this approach? What are the advantages for dictating the frequency of feedback in a policy? It may encourage some consistency and ensure it happens with some regularity. It may be easier to check that it’s happening. It potentially creates artificial assessment opportunities that meet the frequency (as laid out in school policy) rather than assessing and giving feedback where appropriate to aid and improve learning. Its a huge workload for teachers especially in subjects such as humanities where you might teach an entire year group and have to mark / provide feedback for 100s of books every few weeks. The amount of work required here is likely to diminish the effect of feedback. It may promote a culture of valuing the evidence of marking / feedback instead of having a broader understanding of how feedback helps students to progress their learning. Teachers become confused with the idea that working endless hours to evidence marking (often more than a school policy dictates) is whats requires to show they care about student learning (when it may well be holding it back). Are we wrong about stipulating the frequency at which teachers mark and give feedback to students? Is this having a detrimental effect on workload and staff wellbeing? Should we allow teachers to mark/feedback more than a policy dictates? The different colours represent different topics. ‘A’ represent an assessment. ‘F’ represents a lesson dedicated to students acting on feedback. This is just an example to illustrate a point and would require a little more thought! The long term plan above shows where assessment takes place in sequence with learning over a long period of time rather than every 3 weeks (or some other arbitrary number). This could reduce teacher workload by specifying in detail when assessment, feedback take place (teachers should do no more or less) and potentially make marking/feedback more impactful for student learning. It would give clarity of the amount of marking/feedback to teachers, middle leaders and senior leaders. 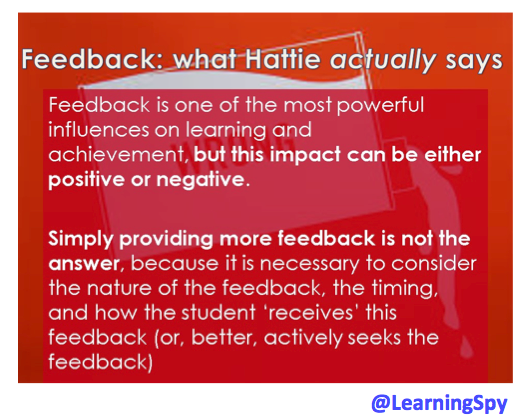 The focus for development could then be on the quality/effect of the feedback on student learning rather than the amount of feedback given. Verbal feedback every lesson, in the moment close to student learning – correcting common misconceptions and modelling great performance /meta-cognitive approaches to tasks. Rather than ‘flashy starters’ embed retrieval practice into the beginning of every lesson as routine to help build memory. Teachers can address gaps immediately (whole class feedback), re-teach and ask students to re-draft / improve work every lesson (without having to mark). This also allows you to interleave knowledge over long periods of time (the retrieval practice doesn’t necessarily have to synchronise with the main objective of the lesson). What about the mock exams? With the rise in the number of mock exams students sit (regular testing is not something I immediately oppose) across key stages, how would the marking and feedback of practice papers fit in? If the purpose of sitting these practice papers is to generate a grade/score then there’s no getting away from marking them. But the amount of information they yield about what students know and don’t know could provide weeks of possible feedback on different bits of knowledge which might reduce the frequency of marking. For example if year 10 sit a mock exam in the first week of term 2 and it takes 2-3 hours to mark a set of papers, provide question level analysis and input data, then that time invested should replicated in the amount of work students have to do in response to the gaps in learning identified by the mock exam. This could manifest itself as a series of homework tasks, retrieval practice starters or entire lessons (D.I.R.T.) given over to improving knowledge. The amount of feedback a teacher could give over the coming weeks could mean that they are not required to mark (written comments, e.t.c.) any further work for the rest of that term. create a system that not only increases the amount of quality feedback students receive (which will in turn progress their learning) but contribute to reducing teacher workload so that students experience more happy and energised teacher. clear the murky waters of ‘book scrutinies’ and have real clarity from each department about what is the best method / frequency of feedback within a specific domain of knowledge, that aids learning. This could be evaluated regularly to ensure that the type/frequency of feedback stipulated by the department is having the desired effect and ensuring that all students are improving their work. clarify for students, teachers, middle and senior leaders precisely when and how feedback will occur inline with what students are learning and in a way that will best serve a particular domain of knowledge. Autonomy | Consistency – Good feedback causes thinking. If feedback is one of the most important factors in improving student work and outcomes. If the modelling of the feedback process enables young people to develop their own self-regulation of improving work. How does a school implement a whole school feedback policy that takes into account the many nuances of each subject? Feedback is important. We feedback to students daily in every lesson in a variety of different ways. Part of my role this year has been to draft a feedback policy for the school so that students consistently get effective feedback across the curriculum. Before venturing any further it’s worth pausing for a moment to consider the difference between marking and feedback (something that is often taken for granted). Marking is very much about checking a piece of work against a set criteria. If the criteria is clear and concise this is something students should do themselves before submitting a piece of work. Providing the criteria is clear then the act of marking should open up the gaps in learning. It’s the feedback that follows to the student that can communicate how well a student has met the criteria and initiative improvements to the work. The purpose of feedback? It has to be to close the learning gaps. 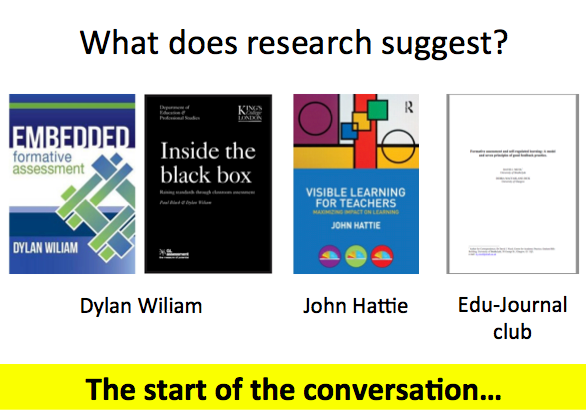 In thinking about and working towards effective feedback it’s worth considering what research on the matter suggests – remembering that the research is just start of the conversation. This is where modelling becomes a pivotal part of the feedback loop. 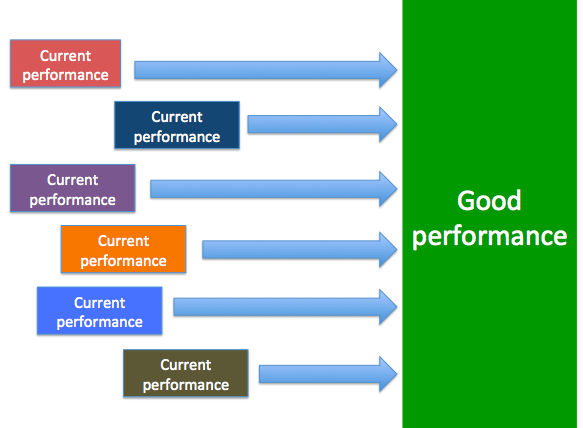 In order for students to achieve the required ‘good performance’ it needs to be modelled to them. This could be through the use of work from previous students or live modelling of current work as students are undertaking the task. Simply providing students with a rubric is not always useful as they tend to be vague and abstract. Showing students an example of good performance and then de-constructing it with them to highlight the success criteria seems a far more valuable use of time. 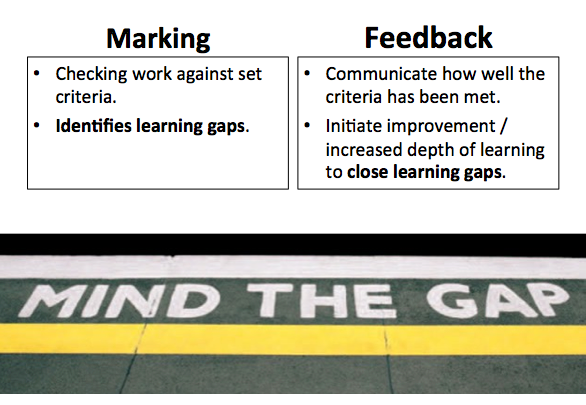 Once students have a more secure understanding of what it is they are aiming for and have made an attempt, they next need to know how far away from the desired good performance they are and what they need to do in order to close this gap – the feedback. I’ve tried this multiple times and have started to embed this into my practice, insisting students check their work against the criteria, check for spelling errors, e.t.c. before submitting the work. I have also in some cases handed work back to students to carry out these checks sending a clear message to students that they must take some responsibility in the feedback process. The key idea to take away here is that feedback is really powerful but its impact has the potential to be both positive and negative. So how do we keep the impact positive? How do we train students and motivate them to actively seek feedback themselves and eventually self-regulate part or all of the process? 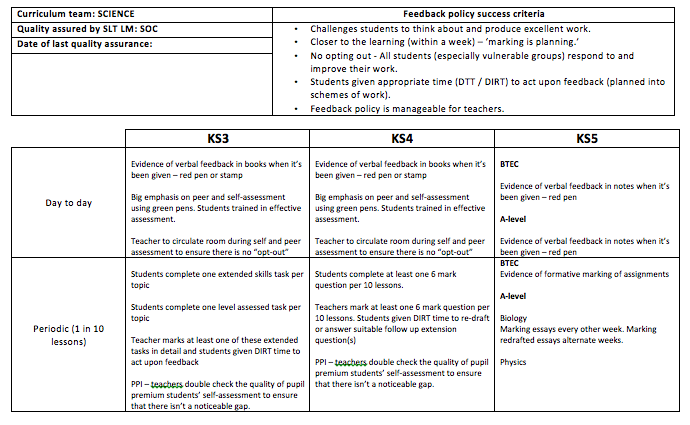 Taking into account some of the ideas from the research and then also spending time talking to teachers in my school who consistently get good outcomes, I drafted (with the help of @Teach_Physics) success criteria for effective feedback (a starting point at least) that could be used to shape a whole feedback policy. These criteria can be applied to both verbal and written feedback. As we began to test the criteria by going through our feedback strategies we quickly found that it is difficult to argue that each is not important for closing the learning gap between current and great performance. One aspect of the criteria that we discussed at length was should a feedback strategy be created with observers in mind and be made explicitly visible to them. The answer is probably no. 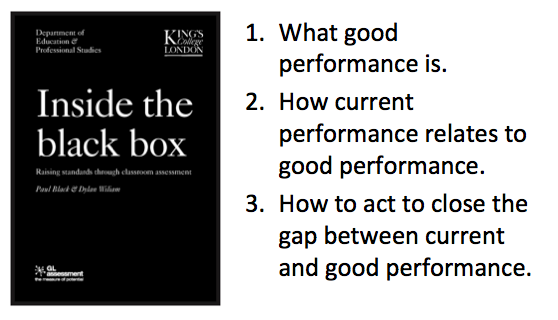 Feedback strategies should concern themselves with improving student awareness of great performance and closing the gap between current and great performance. 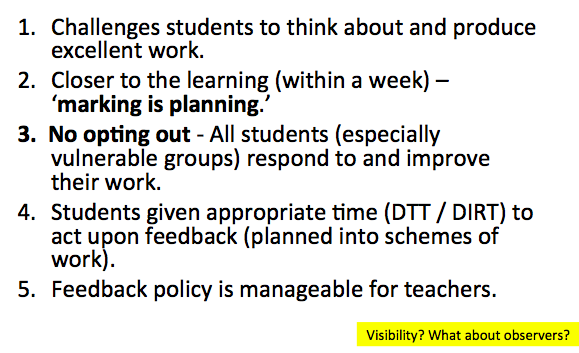 Ofsted don’t dictate how feedback is given or the frequency of it, therefore as long as a feedback policy contains examples of the strategies being employed by teachers, the emphasis can be placed upon the observer to look at the policy beforehand so they know what to look for. This is an important step forward as it stops teachers creating redundant feedback strategies that have the sole purpose of pleasing an observer rather than closing the learning gap. Drafting a whole school feedback policy. 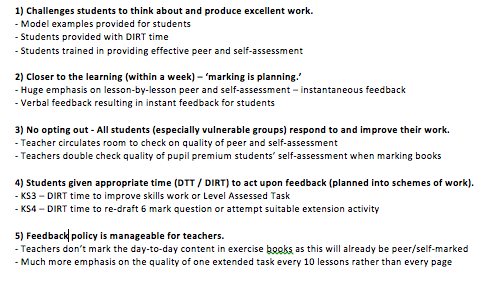 The principles of effective feedback (see success criteria) are probably the same across different curriculum areas. The feedback strategies employed by teachers across different curriculum areas are probably not the same. It’s possible to challenge the student in both cases to think about and produce excellent work through verbal (probably easier with verbal feedback in a practical situation as the teacher can model it immediately) and written feedback. Feedback can be close to the learning – in the moment for the student in PE. The challenge for the English teacher is the turnaround of marking/feedback but there are strategies to help achieve this (code-marking for example). Ensuring no student opts out of the feedback (especially vulnerable groups like pupil premium) is challenging and there may be issues beyond the teachers control that impact on this, but that doesn’t mean to say we should not aspire to every student acting on feedback to improve their work and close the gap to great performance. 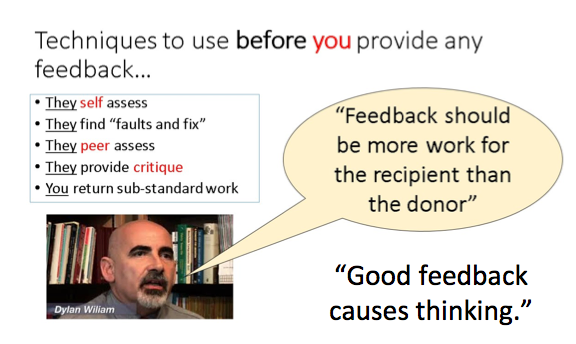 Giving students time to act on feedback is paramount to effective feedback otherwise whats the point? In both situations in this example it’s possible to give students time and space to act on the feedback they receive. It may require some planning in terms of building time into a SoW, but this is a really important part of the process. Is it manageable for teachers? This is another challenge, but not an impossible one if the teachers (in this example) are prepared to experiment with different strategies (especially when dealing with written feedback). 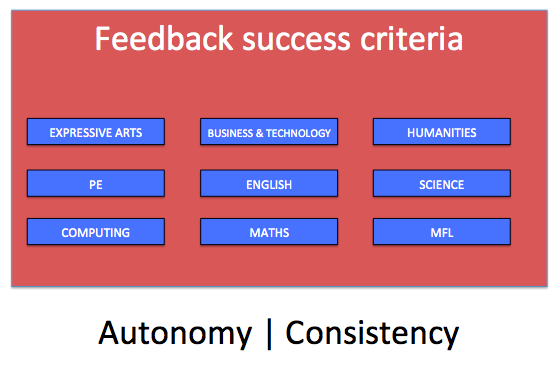 This academic year we’ve moved our policy on feedback forward by setting the criteria for effective feedback (and we’re open for this to change as new ideas emerge) and then asking curriculum areas to use feedback strategies that hit the criteria and work for their subjects – Autonomy | Consistency. This will be a working document that is quality assured and tested throughout the academic year through regular work evaluations and lesson observations. 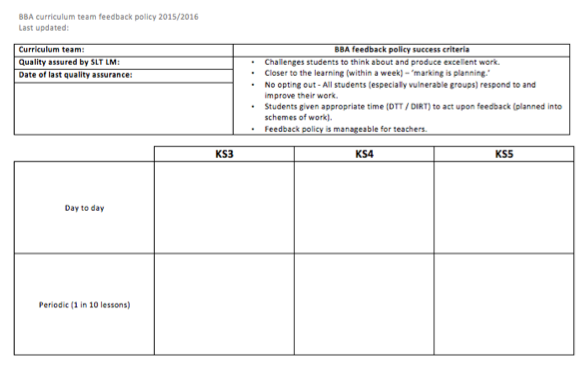 The policy also includes an appendix for each curriculum team which they will update with examples of the feedback policy in action so that observers have a clear idea of what they should before going into any classrooms. It makes supportive accountability easier as the curriculum teams have come up with their own strategies (that meet the criteria). Feedback matters – lets embed it into our practice rather then bolt it on.